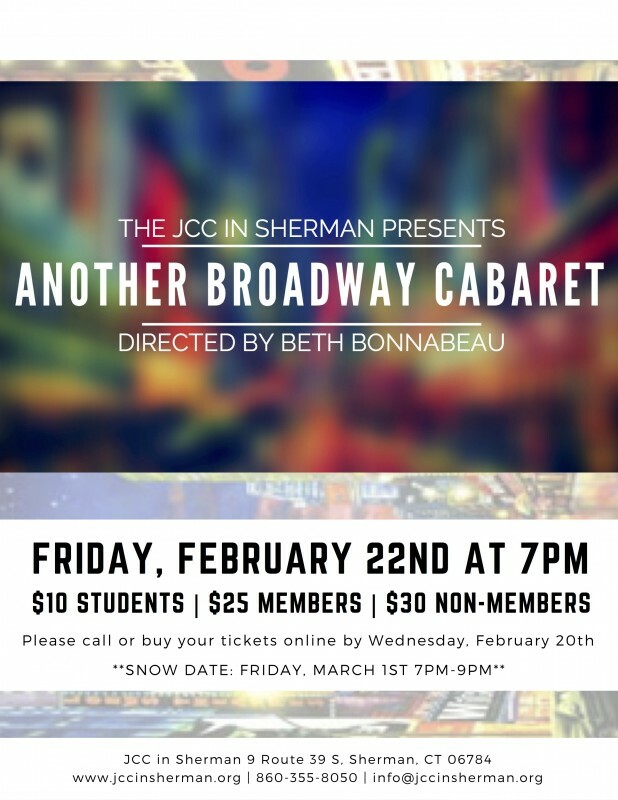 Beth Bonnabeau is is back directed Another Broadway Cabaret with an Amazing CAST! This performance will be on Friday, February 22nd at 7PM with a snow date of Friday, March 1st. Some of the area's best singers gathered at the JCC last summer under the direction of Beth Bonnabeau to put on a Broadway Cabaret. It was such a smash, we've asked them to come back and do ANOTHER BROADWAY CABARET! Songs from shows old and new (Rent, Carousel, The 25th Annual Putnam County Spelling Bee, etc) will be performed by local singers including Lynn Paulella Beard,Joe Harding, Catherine McCollian, Elizeth Brito, Josie Harding and Alicia Dempster among others. This joyful night full of music from the great white way sold out quickly the last time around, so don't miss out! Beth Bonnabeau has been acting and directing locally for decades, is the Founder and Artistic director of The PAC at 32 Below, a performing arts center housed in the lower level of the Connecticut Sports Arena in New Milford. The PAC offers production opportunities for students ages 6-20 as well as MainStage adult productions. Beth received her BFA in Theatre from SUNY Plattsburgh where she served as President of Alpha Psi Omega (National Theatre Honors Fraternity) and Vice President of the College Theatre Association. After a stint with The Harold Klurman theatre on NYC’s famed Theatre Row, Beth switched gears to become a Mom to two wonderful young thespians and a teacher of theatre to countless others. With 23 years as a theatre educator under her belt, Beth has no intention of switching gears again!